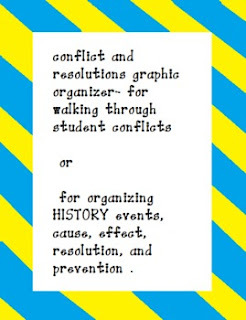 This graphic organizer has room for 4 events or conflicts in history. (students' history or any historical event..depending if you are teaching about general conflicts or if you are teaching about events and conflicts, such as wars, in history.) There is a column for the event, cause, effect, resolution, and how it could have been prevented. Good for center work. Great for higher order thinking! or graphic organizer for history units!